Consumption of steam coal used for electricity generation in the U.S. electric power sector fell 29% from its peak of 1,045 million short tons (MMst) in 2007 to an estimated 739 MMst in 2015. Consumption fell in nearly every state, rising only in Nebraska and Alaska over that period. 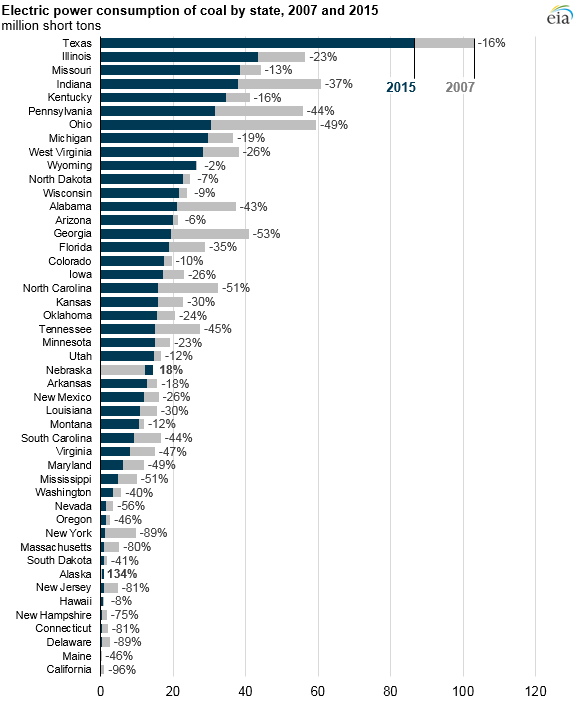 States with the largest declines were concentrated in the Midwest and Southeast, with six states in these regions accounting for nearly half of the national decline. Smaller declines in power sector coal consumption occurred in Wyoming, North Dakota, and Montana, all in the Rocky Mountain region. In the United States, 97% of all steam coal is used to generate electricity. With little or no growth in electricity sales in most states between 2007 and 2015, coal use for electricity generation is closely related to coal's share of total generation. The price and availability of fuels other than coal have had a major effect on coal consumption since 2007. 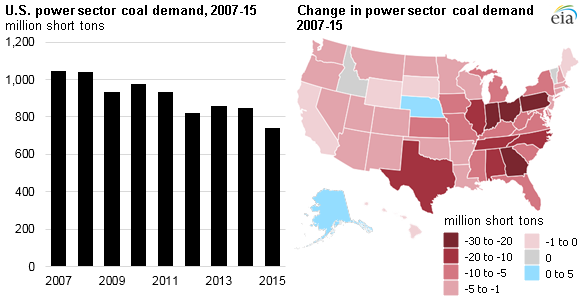 Increased supply of natural gas and a resulting natural gas price decline spurred increases in natural gas-fired power generation in several states, generally at the expense of coal-fired generation. Electricity generation from wind and solar sources also increased significantly over this period, driven by a combination of federal tax credits, state-level mandates, and technology improvements. Coal use in the electric power sector decreased in Ohio, Pennsylvania, and Indiana by 49%, 44%, and 37%, respectively, between 2007 and 2015. In Ohio and Pennsylvania, increased production of natural gas from the nearby Utica and Marcellus shale plays resulted in more and relatively less expensive natural gas being available to power plants in these states. Indiana's legislature created a voluntary energy portfolio standard, which took effect in 2012, encouraging electric utilities and retail power generators to generate more electricity from renewable fuels and nuclear, as well as from any natural gas generators that displace existing coal-fired generation. Combined natural gas consumption at electric power plants in Ohio, Pennsylvania, and Indiana increased from 219 billion cubic feet (Bcf) in 2007 to 777 Bcf in 2015. Coal consumption from these three states fell from 176 MMst to 100 MMst over the same period. In the Southeast, coal consumption in Georgia, North Carolina, and Alabama in 2015 was half the level it was in 2007. Electric power plants in these states increased their natural gas consumption from 338 Bcf to 1,021 Bcf, and they reduced their coal consumption from 110 MMst to 56 MMst. Note: Values reflect coal receipts by electric power plants rather than coal consumption. Differences in receipts and consumption are relatively small and attributable to changes in stockpile levels. The decline in power sector coal consumption across these six states was often accompanied by shifts in coal supply sources. In general, imports and receipts of coal from distant sources decreased the most. Indiana and Ohio received much less coal from the Powder River Basin in Wyoming and Montana in 2015 than in 2007. In both Georgia and North Carolina, the largest decline in coal receipts came from Central Appalachian coal, which was partially offset by higher receipts of Illinois Basin coal. Alabama's imports of coal (mostly from Colombia) dropped over this period. Note: Idaho, Vermont, Rhode Island, and District of Columbia have no coal consumption in the power sector.